Nach 40 Jahren werden KISS für eine letzte Tour die Bühnen der Welt rocken. Kiss-Frontmann, Paul Stanley sagt: "Dies wird unsere letzte Tour sein. Es wird die explosivste und größte Show werden, die wir je gemacht haben. Leute, die uns lieben: kommt uns besuchen. Wenn du uns noch nie gesehen hast, ist es Zeit, denn es wird die letzte Show sein." 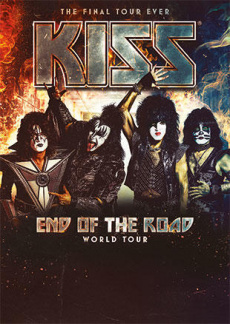 Die allerletzte Tour, mit dem passenden Namen „END OF THE ROAD 2019“ löste einen Internetsturm durch erwartungsvolle Fans aus, die sich erhofften, in ihrer Stadt ein finales KISS-Konzert besuchen zu können. In Deutschland finden Sechs Open Air-Shows in Leipzig, München, Essen, Berlin, Hannover und Iffezheim statt. Wer die Legenden der Rockmusik live erleben möchte, bekommt hier bei uns Tickets für KISS! Kiss (more often styled as KISS) is an American hard rock band formed in New York City in January 1973 by Paul Stanley and Gene Simmons. Well known for its members face paint and stage outfits, the group rose to prominence in the mid to late 1970s with their elaborate live performances, which featured fire breathing, blood spitting, smoking guitars, shooting rockets, levitating drum kits and pyrotechnics. Before arriving at their current lineup, the band went through some lineup changes, with Stanley and Simmons the last two members of the original lineup of the band. Counting the 1978 solo albums, Kiss has been awarded 28 gold albums to date, the most of any American rock band. The band has sold more than 40 million albums in the United States, of which 24 million have been certified by the RIAA and their worldwide sales exceeds 100 million records, making them one of the world’s best-selling bands of all time. The original 1973–80 lineup consisted of Stanley (vocals and rhythm guitar), Simmons (vocals and bass guitar), Ace Frehley (lead guitar and vocals) and Peter Criss (drums and vocals). 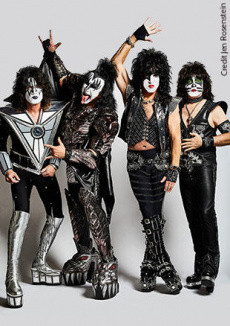 With their makeup and costumes, they took on the personas of comic book-style characters: Starchild (Stanley), The Demon (Simmons), Spaceman or Space Ace (Frehley) and Catman (Criss). Stanley became the "Starchild" because of his tendency to be referred to as the "starry-eyed lover" and "hopeless romantic". The "Demon" makeup reflected Simmons cynicism and dark sense of humor, as well as his affection for comic books. Frehleys "Spaceman" makeup was a reflection of his fondness for science fiction and his supposedly being from another planet. Criss "Catman" makeup was in accordance with the belief that he had nine lives because of his rough childhood in Brooklyn. Due to creative differences, both Criss and Frehley were out of the group by 1982. The bands commercial fortunes had waned considerably by that point. Buoyed by a wave of Kiss nostalgia in the 1990s, the band announced a reunion of the original lineup in 1996. 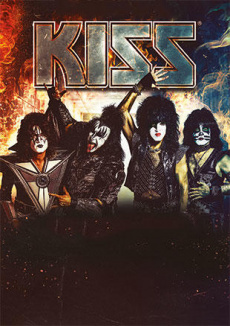 The resulting Kiss Alive/Worldwide/Reunion Tour was the top-grossing act of 1996 and 1997. Criss and Frehley have since left Kiss again, but the band continues with Eric Singer and Tommy Thayer. Stanley and Simmons have remained as the last two constant members. Kiss has been named in many "Top" lists. They include Number 10 on VH1s 100 Greatest Artists of Hard Rock, 9th on The Greatest Metal Bands list by MTV, number one on Hit Paraderss "Top 100 Live Bands", 56th on VH1s "100 Greatest Artists Of All Time", and 26th on Gibsons "50 Greatest American Rock Bands". On April 10, 2014, Kiss was inducted into the Rock and Roll Hall of Fame, nearly 15 years after becoming eligible. I've seen the concert in the Madison Square Garden. End of the roadster is really Amazing ! Kiss im Jahr 1976 Düsseldorf Fillipshalle vorgruppe Scorpions,beide das erste mal Live,und Super Fan bis heute. Und so Gott will Abschied Tourne Live in Essen.Kiss ihr ward eine Klasse für sich, Danke für mehr alles 40 Jahre. Commandés la semaine dernière, les billets ont été reçus aujourd'hui en Belgique par recommandé. Eines der mindestens noch 95/100 Dinge die ich mir vorgenommen habe bis zum "Final Countdown, of my own Life, since I changed it with fiftytwo"! Fan seit 1976 in USA und nun, s.o* RUHRPOTT, my Love und Essen...ich komme !! !